It’s time to say goodbye to another friend from South America who has lost his life in the mountains. The Argentine climber Leonardo Rasnik was found dead in the Peruvian Andes on Thursday with his climbing partner Natalio Funes. They had set out to climb 6034m Tocllaraju near the town of Huaraz in the Cordillera Blanca mountain range, but were reported missing when their base camp was found abandoned. Although the cause of death is still unconfirmed reports suggest they may have died in an avalanche. The standard route on Tocllaraju is a straightforward alpine climb graded AD, but the route passes through a serac field and is sometimes blocked by an impassable crevasse. 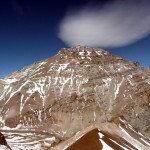 Climbers on the mountaineering community website Summitpost have also reported dangerously high levels of rockfall there. Leo was assistant guide for the American mountaineering operator Aventuras Patagonicas when I climbed Aconcagua by the False Polish Route in 2010, and a more cheerful and enthusiastic human being you couldn’t wish to meet. Hard working and unassuming, he often walked at the back of the group singing quietly to himself, yet was always eager to assist and encourage his clients when he sensed people needed it. I remember questioning him at length about some of the wildlife in the Vacas valley during our trek in. When he was unable to answer my questions he asked one of the rangers at our campsite that evening and brought me the answer the following day. Like all good mountain guides he was determined to get his clients to the summit, and two of our team, a French-Canadian couple called Guillaume and Maude, owe their success on Aconcagua to Leo’s persistence. When I saw them tired out and talking about turning back at Independencia Hut, halfway up on summit day, I assumed it would be the last we saw of them that day. But step by step Leo encouraged them onwards, and I was astonished to see them at Cresta del Guanaco, the traverse just below Aconcagua’s summit, while we were on our way down. They were absolutely exhausted and hardly able to speak, but Leo was grinning as usual and barely out of breath, and answered our questions about how on earth he managed to keep them going with a cheerful shrug. Nothing illustrates Leo’s industrious nature more than the photo I have chosen to illustrate this post. 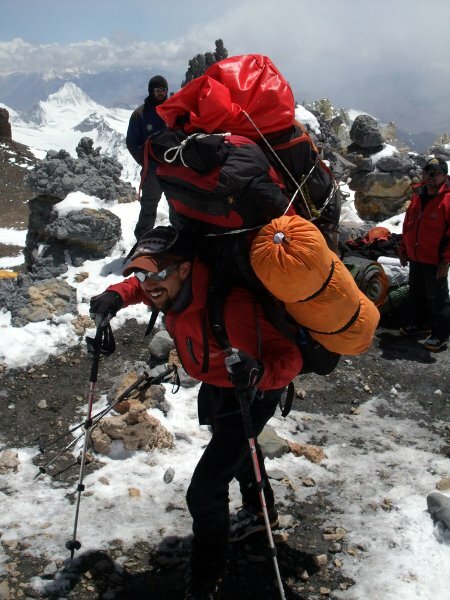 I’m accustomed to seeing mountain guides carrying ridiculous loads over the years, but this one is verging on the superhuman. On the morning after our successful summit we had the option of paying high altitude porters to come up from base camp at Plaza de Mulas (4400m) to Colera Camp (6000m) and help us with some of our kit. I had no qualms about forking out USD $200 to have my 30kg load reduced to a more comfortable 10kg. The porters brought spring balances with them to help with negotiations, and out of curiosity we decided to weigh Leo’s pack to see just how silly it was. The answer was a staggering 47kg, a load that would kill me just lifting, never mind carrying 1600m down a mountain. Not surprisingly Leo was a little bit slower than we were during the descent, and after waiting for him a few minutes at Nido de Condores, a sprawling plateau at 5600m, we decided to press on. 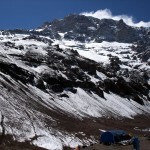 A couple of us were taking it easy behind the rest of the group and had just started out down the giant 1000m scree slope leading down to base camp on Aconcagua’s western side when we heard a cry behind us. We turned round to see Leo running (yes, running) towards us carrying his giant 47kg pack like a giant tortoise in a sprint relay. When he reached Nido and found no trace of us there, he was so distressed we might get lost on the way down that he came chasing after us. 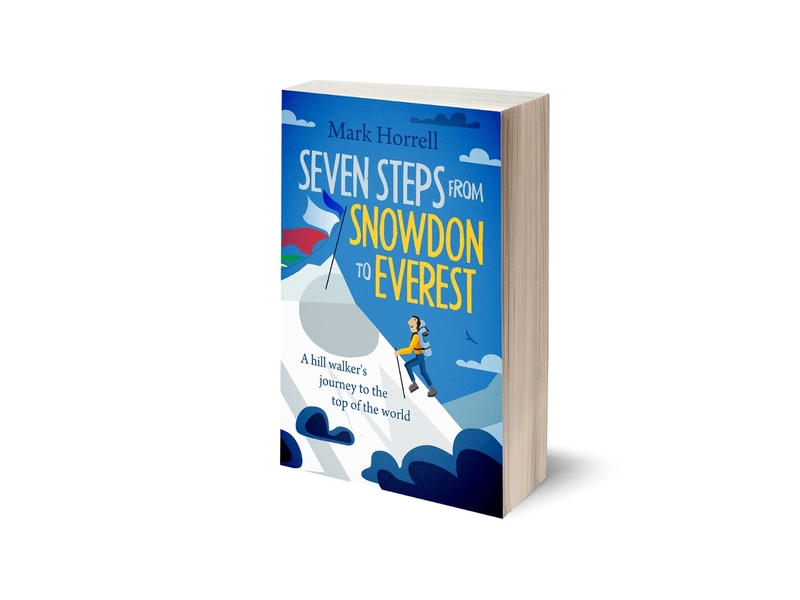 We stopped and waited for him to catch up, and he slumped down on the scree slope, his giant pack like an armchair behind him. “Are you trying to kill me, man?” he asked after he regained his breath. But he wasn’t really angry with us. It’s hard to believe he was ever capable of being angry. We made him promise to stay still until he was thoroughly rested, and we went chasing after the rest of the group for him. There aren’t many people who seem to be without a single character flaw, but Leo was one of life’s genuinely nice people. He leaves behind a wife and two year-old daughter who was born soon after our expedition. My thoughts go out to all his family, and all the people whose lives he touched during his short guiding career. 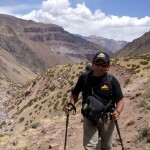 I climbed with Leo on Aconcagua in 2010 and 2011. 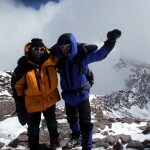 We reached the summit together on January 21, 2011. You are right that he was superhuman in strength. He was such a wonderful guy–a really decent, nice guy. His gentle encouragement made the difference when things got tough. I will really miss him. I’d like to help out if you have any contact info for his family.